It is the day before our big night. Tomorrow night will have Rimu Class on stage in front of a huge crowd of whānau and friends from the Hornby community to perform our Pasifika item. Live has been working hard to create our costumes and lanterns. We have one more rehearsal today and then tomorrow we will no doubt have some pre show jitters. For me, this is the highlight of the term and I can't wait to see how the children show what they have learned. Check out our blog on Friday to see photos and hopefully a video. I can't wait for the Pasifika performance tonight I'm just speachless because I'm just so excited. Hey its Izzy and the days is here for the Pasifika Performance tonight and I can't wait. I can't wait to see some more photos tomorrow. Bye. Hi Miss Waho it's Hannah typing. 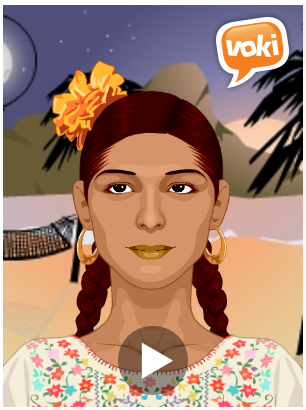 I love your post because of your voki and way you described about the pre performance. I know for sure you described your post better then me bye. Very awesome pre performance thoughts here Miss Waho and the voki is really detailed and i'm really excited about the dance. Hi my name is Heaven. I'm in room 5. Wow, this app is pretty cool, maybe i'll use it sometimes for an animation it will be cool. Here is a question, how did you first find this app. well this is all from me. Hi my name is sweyde I go to tautoro I like your new site I have never heard of this site before. Blog you later. Hi my name is charlee,Very AWESOME performance thoughts here Miss Waho and the voki is really detailed and i'm really EXCITED about the dance.